Grab your headphones, Sonic fans! 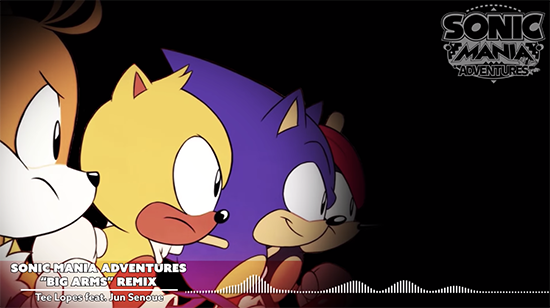 As SEGA announce plans to release brand new remixes of select songs from the popular animated web-series, Sonic Mania Adventures. Revisit Sonic’s quest to outsmart the evil Doctor Eggman on Angel Island, with reimagined tracks from iconic Sonic series by composers Jun Senoue and Tee Lopes. The remixes include the iconic sonnet, “Big Arms,” which plays during the legendary, final boss battle in Sonic 3, as well as more recent tracks including Sonic Mania’s title theme song. The duo will release a total of four tracks together with a fifth by Tee Lopes, all arriving exclusively on the Sonic the Hedgehog official YouTube and social media pages. Sonic the Hedgehog track 'Big Arms' hear it above. Sonic fans can hear more high-energy music tracks from Jun Senoue and Tee Lopes in upcoming kart-racing experience, Team Sonic Racing. Developed by award-winning studio Sumo Digital, Team Sonic Racing is the ultimate arcade and fast-paced competitive style racing experience, featuring your favorite characters and environments from across the Sonic Universe. Race together and win together in online multiplayer or local co-op mode utilizing the dynamic team mechanics and vehicle customization features to dash across the finish line. Team Sonic Racing is set to release both physically and digitally on May 21, 2019 on Sony PlayStation 4, Microsoft Xbox One and Nintendo Switch, with a digital-only release on PC.